Celebrating the life of Robert Thomas King Sr.
Obituary for Robert Thomas King Sr.
Robert T. King Sr., 71, passed away on Friday, February 1, 2019 at Tomah VA Medical Center. Funeral services will be held at 1:00 pm on Friday, February 8, 2019 at Rembs Funeral Home, Marshfield, where the visitation will be from 11:00 am until service time. Burial will take place in Gate of Heaven Cemetery, Marshfield, where military rites will be conducted by the American Legion Post 73 of Neillsville. Robert was born on April 5, 1947 in Newark, NJ, to James Edward and Dorothy (Reiman) King. He attended schools in Newark, NJ and Daytona Beach, FL. In 1965 at age 17 he enlisted in the United States Army until 1968. He then joined the Army Reserve and was honorably discharged as a sergeant in 1978. He had served in Vietnam, Cambodia and Germany. Bob was a “jack of all trades” and liked working with his hands. He had worked as an electrician, plumber, mason and farmer. 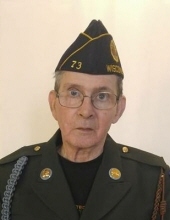 He was a member of the American Legion in Neillsville and in Monticello, IN, the Vietnam Veterans Memorial Fund, a lifetime member of Am Vets, the Vietnam Veterans of America and many other organizations. He enjoyed fishing, shooting at the gun range, mechanic work, cooking, baking, spending time with family, and playing cards and Monopoly. He is survived by 5 children, James Edward King, of Green Bay, Debra Boucher, of Neillsville, Kristy Bixler, of Rensellaer, IN, Misty Kaetterhenry of Marshfield, and Robert T. King Jr. of Marshfield. He is also survived by 16 grandchildren and 2 great grandchildren. He was preceded in death by his parents, a son, Joseph Charles King, a brother and a sister. The family wishes to thank the staff at Tomah V.A. Medical Center for the amazing, loving care they provided. "Email Address" would like to share the life celebration of Robert Thomas King Sr.. Click on the "link" to go to share a favorite memory or leave a condolence message for the family.